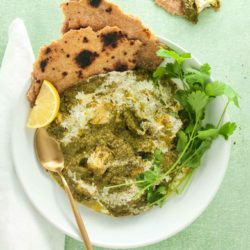 Spinach halloumi curry (palak halloumi) – creamy, garlicky spinach curry simmered with chunks of salty halloumi. Served with flaky, buttery paratha and thick, cooling yoghurt. This south Asian-inspired dish couples the best of the region’s cuisine – garlic, chilli, spices and beautifully cooked vegetables – with soft, chewy, tender pieces of cheesy, umami halloumi. Served with easy whole wheat flatbreads – or parathas as they are also known. These magnificent breads are the puff pastry of the flatbread world – thin, rolled layers of dough brushed with butter and folded over and over to make gorgeously separate, buttery layers. And for this rich, creamy dish I decided brown butter would be an excellent complement. So that’s what moistens and enriches these lovely breads. 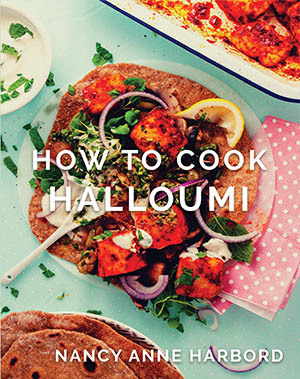 Serve the palak halloumi with the hot bread, lemon wedges for squeezing and big dollops of cooling Greek yoghurt. Pile hot, tender halloumi on buttery bread, spoon over more green, garlicky sauce and eat. Creamy spinach curry – palak in Hindi – simmered with chunks of salty, chewy halloumi. With flaky, buttery parathas and dollops of cooling yoghurt. Add the onion to a food processor and purée, scraping down as needed. Set aside. Heat a large pan of boiling water, blanch the spinach for 1 minute and shock in cold water – this helps fix the green colour. Drain the spinach and add to the food processor, blending to a purée with the lemon juice, sliced chillies and 1 clove of the crushed garlic. Set aside. Heat a good drizzle of oil in a large saucepan over medium heat until hot and fry the fenugreek and cumin seeds until they start to pop. Add the onion purée and stir to combine. Caramelise the onion by leaving it undisturbed until it starts to brown, then stir and repeat until it is all well caramelised – this should take at least 10 minutes. When the onion is ready, add the rest of the garlic and cook until fragrant, about 2 minutes. Add the turmeric, ground coriander and asafoetida and cook for a few seconds. Add the spinach purée and 100g water and simmer on low for 5 minutes – the sauce should be thick, but add a little more water if you think it needs thinning. Add the cheese and its brine to the spinach sauce. Stir through the garam masala, cream and 1 teaspoon flaky salt, cover and rest for 10 minutes. Check the seasoning before serving. Add the butter to a small saucepan and heat over medium-low heat until the milk solids caramelise and the butter is dark golden brown. Add the flour and 1 teaspoon flaky salt to a food processor and whizz to combine. Drizzle in half the melted butter and blend to combine well. With the machine running, add enough boiling water (about 100g, depending on your flour) to form a supple dough that is not sticky. Continue blending for 1-2 minutes to knead the dough, until it is smooth, soft and a little shiny. Cover with plastic wrap and rest for at least 10 minutes. Divide the dough into 8 pieces – keep the dough balls covered in plastic wrap while you work. Roll 1 dough ball into a 20cm round. Brush brown butter evenly over the dough round and sprinkle with a tiny bit of flour. Roll another 20cm round and lay over the first. Fold the edges of the dough into the centre, making a rough hexagon. Turn the package over, sprinkle with a little flour and roll out again into a 20cm round. Heat a large, heavy frying pan over medium heat until very hot (you don’t need any extra oil). Add a rolled paratha to the pan – it should bubble in about a minute and be spotted brown on the heated side. If it takes much longer than that, the paratha will dry out before it browns and become tough and inflexible, so adjust the heat accordingly. Flip the paratha and cook for another minute to brown the other side. Keep the cooked parathas soft as you work by wrapping the stack in a clean, lightly damp tea towel. Serve the curry with Greek yoghurt and lemon wedges on the side and scoop everything up with the parathas.